Vibrant colors coming to life, hand drawings of complicated charts, ideas that demand a world of their own; you get all this and more if you have your animation down pat! With the increase in its trend, animation is one of the most sought-after marketing techniques. It is widely used in branding, imaging, education, and a lot of other fields. Until now, Microsoft PowerPoint was the popular choice to help with those arrow tricks and zooming gradients. But that has changed; with the rising demand for cool animation tricks, comes the increase in the number of animation software options available in the online market. However, one fact remains established: Animation is the key to any marketing proposition you make to capture your audiences’ attention. Now that that’s established, if you wanted to use animation marketing for your latest project, how would you go about selecting the right tool? Of course you’d need something easy to use so you can avoid the need of seeking help from a professional. At the same time, you need to avoid doing a sloppy job of it. You need to ensure that the end product looks as good and as professional as an expert would do it. That’s exactly where tools like VideoScribe come into the picture. 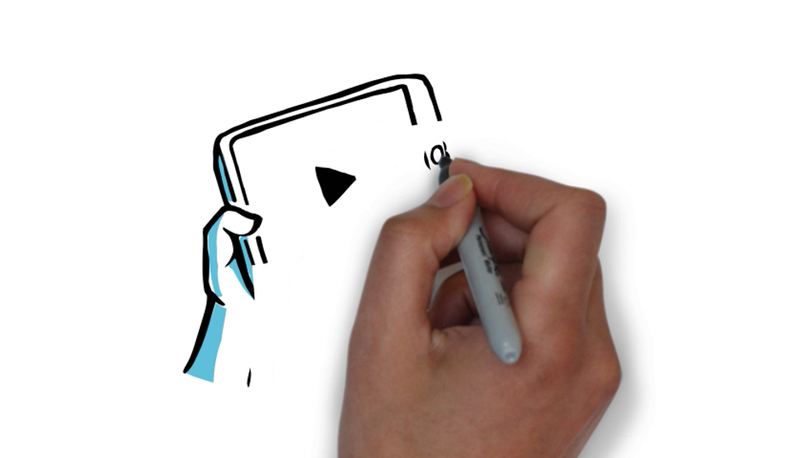 VideoScribe – Making Doodling Fun! 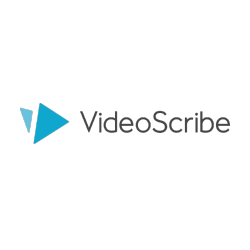 Created by Sparkol in 2012, VideoScribe has seen a surge in their number of customers, and for excellent reasons too. They are at the top of their game when it comes to whiteboard animation, and have gained customers in not only the marketing industry but also in government agencies. VideoScribe has been used to create presentations by the US government, the Swedish parliament, and the UK government. The animation software allows you to create engaging presentations without the help of a professional. It can be installed as a desktop program on both, Mac and Windows. What’s more, you can download its application on tablets running Android or iOS. The interface that VideoScribe provides is intuitive. A little playing around with the application and you will know what all the icons do and what templates are available. Additionally, you get guidebooks and tutorials to help you create engaging presentations. A huge library of high-quality images to add to your presentation. You have the option to purchase premium images if you can’t find a suitable free one. Support for video size and resolution modification. Vast collection of royalty-free music to add your video. Voiceovers can be imported or recorded. Ability to add your own watermark / logo (premium feature). MOV, WMV, and AVI file formats for your video output. JPG and PNG sequence offered too. Facility to share whiteboard presentations on Facebook and YouTube or covert them to Microsoft PowerPoint presentations. Saving projects online while working on them offline. Created on one device, your VideoScribe presentations can be downloaded to multiple other devices. Launch VideoScribe and click on ‘Create a New Scribe’. Click on ‘Add an image to the canvas’ and type what you are looking for in the keyword search field. After you select the image, you can make changes to its resolution, size, or color in the ‘Image Properties’ window. All effects that you add to your image come with a preview. Click ‘Add text to the canvas’ and type the text in the ‘Add text’ window. You can change the font, size, and color of the text. Click on ‘Add a chart to the canvas’ and select the type of chart, dates for data depiction, and color in the Add chart window. Click ‘Add or change a music track for this scribe’ and select a track by browsing for it in the ‘Browse music’ window. Click ‘Add or change the voiceover for this scribe’ and click Record in the Voiceover window. You can also change the background paper for your whiteboard presentation by clicking ‘Change the paper texture and color’ and selecting one of the available options in the ‘Paper options’ window. Click ‘Select a different default hand for this scribe’ and select one of the options in the ‘Select hand’ window. You could even add something of your own by clicking the ADD YOUR OWN button. To save your creation, click on Save or export this scribe -> Take a single snapshot to a PDF document. To save the scribe locally, type the name of the scribe in the ‘Save scribe’ window and save it on your system. To save your scribe online, click on ‘Save (export) online’. To export your scribe, click ‘Export to a “scribe” file’. To import your file back, click ‘Import’ and save it locally. To publish your project, you must create a video file. Click ‘Publish (render) your scribe video’ and you will be able to share your video on Facebook and YouTube. The massive library of high-quality images and sound tracks. Eliminates the need of a professional. Something that the others in its competition are offering: sketch to video. The sketching of a video before it plays is a good-to-have feature, and bundled with VideoScribe, it would really be the whole package. The lifetime package of this software does come at a price too steep. If you are just starting out, investing in an expensive product like this one might not be a good idea. Overall, we’d say that VideoScribe does the job and does it well! The best part about it is that you can find out for yourself and test its mettle by trying it out for free. So go, download it right away! Posted July 31st, 2017 in Content. Tagged: animation, presentations, video, whiteboard. People who work in teams understand the purpose and vitality of whiteboards. What looks like a simple, glossy, white surface actually solves the purpose of a thousand notebooks, scrap books, blueprints, maps, or any other term you might want to give to something that is used while planning and brainstorming for development. Today, you’d hardly find an organization that doesn’t use whiteboards in its discussion rooms. Even schools have made a switch from black and green boards to the more sleek white boards, and there’s a genuine reason behind the liking. Whiteboards are smoother, easier and quicker to clean, and can also be used as projector backgrounds. No wonder they’ve become so popular. With technology taking people places, project teams have become distributed. People often make use of online tools to collaborate and share ideas. Even meetings are conducted through video conferencing. But then, how can whiteboards be carried around? Does that mean teams no longer have a tangible place to brainstorm and depict their ideas through flow diagrams? Well, that’s where RealtimeBoard comes into picture. 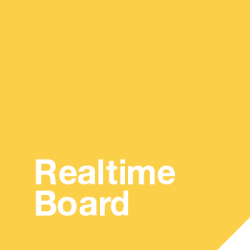 RealtimeBoard – collaboration made simple! The makers of the tool work with the mantra – “a picture paints a thousand words”. If you ask us, RealtimeBoard lives up to that mantra in every single aspect. Visit the tool’s homepage and click on the blue button that says, “Start Collaborating Now”. You’ll be asked to sign up. Just punch in your name, work email and a password. Next, you’ll be asked to provide your official details, as in, team name, company size and a work phone. You can also start adding teammates immediately or leave that to later. A few more details later, you’ll be all set. If you wish to, you can watch a 2 minute video about how to use RealtimeBoard on the next screen. That will save you a lot of time of exploring the platform. Post signup, you’ll have access to all premium features of the tool for 14 days. Once the trial period expires, you’ll have the choice to either downgrade your account to a basic one or pay to keep your premium features. 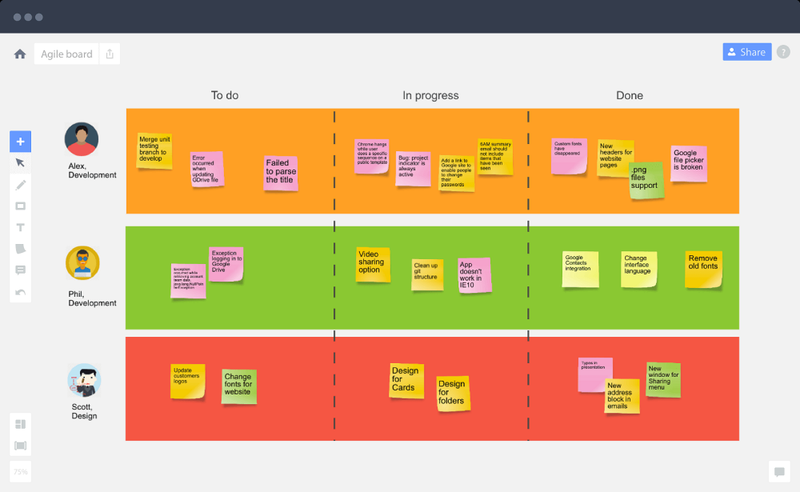 Once you’ve reached your board, you’ll see a grid layout depicting your whiteboard. 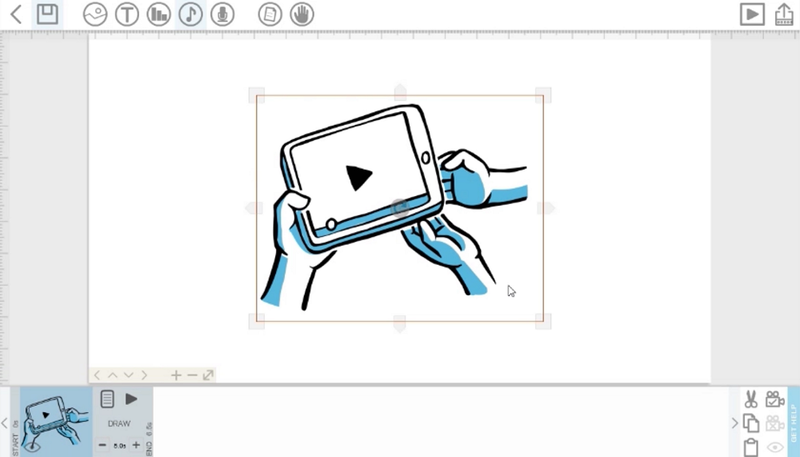 On the left hand panel you’ll see a toolbar including various editing options – Insert Tool, Selection, Text Box, Sticky Note, Shape Drawing Tool, Pencil, Comment Box, Undo / Redo Button, Frames Tool (to create presentations from whiteboard), Full screen Toggle, Zoom In / Out Button. Go ahead, give the whiteboard a try, it’s quite simple really. Once you have some ideas drawn or inserted or pasted (sticky notes) on the board, you can choose to export it as an image, PDF, download as backup, save to Google Drive, or attach to JIRA. To do this, click on the up arrow on the top left side of the screen next to your board’s name. Alternatively, you can invite teammates to edit the ideas or leave their comments. This can be done by clicking on the message icon on the bottom right corner of the screen. You can also share the board with other people by emailing them the link of the board. For this, click on the “Share” button on the upper right corner of the screen. If you click on the home icon on the upper left corner of the screen, you’ll be redirected to your dashboard. Here, you can view all your different whiteboards and also keep monitoring the whiteboards other people have shared with you. This screen also displays some helpful examples of whiteboards fitting to different scenarios. 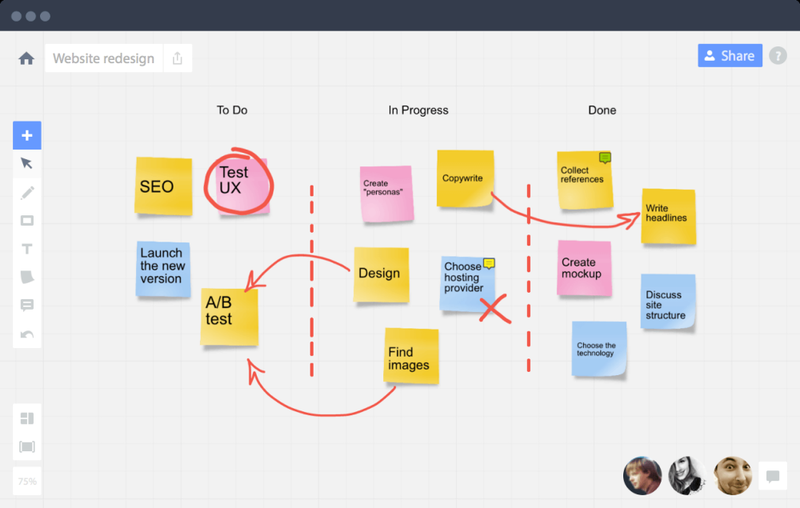 RealtimeBoard proves to be quite an interesting brainstorming platform for distributed teams. It has a lot of pros associated with it which are evident from its feature description and usage. But there are a few drawbacks too. Deleting stuff on the board is tricky. You have to select the object to be deleted through the selecting pointer (arrow on the upper left corner of the toolbar), then right click to open a pop-up menu and then select delete. A simple erase button would’ve been more convenient. The tool is truly beneficial only for teams that have people located at different physical places. In house teams can be much quicker with actual whiteboards. The tool isn’t free of cost unlike the good old physical whiteboards. Good tool, but only for those who wish to bring in a certain level of organization to their brainstorming sessions. Posted October 11th, 2016 in Communications. Tagged: collaboration, organization, planning, tool, whiteboard.